Founded in 1838, the Pallottine Missionary Society was created to assist Roman Priest, Vincent Pallotti, with his life’s mission of service the sick and poor. The first Pallottine Sisters made their way to the United States in 1912, passing the wreckage of the Titanic, as their own ship made it’s way safety between the icebergs. In 1920, they were invited to open a hospital in Buckhannon, West Virginia. 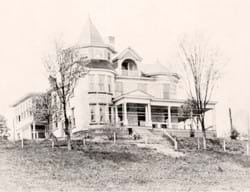 Four Sisters followed the call on February 15, 1921, purchased the beautiful Barlow estate on a hilltop overlooking the town. “The Overlook” consisted of a four-story wooden building faced with yellow brick on nine acres of land. The rather large private home was converted into an eight-bed hospital and convent for the Sisters with the help of good friends and benefactors. Over the past 97 years, St. Joseph’s Hospital has developed from an eight-bed hospital to a medical community dedicated to serving the needs of the residents of central West Virginia. St. Joseph’s Hospital remains committed to its mission with an ever-vigilant focus on its Christ values. In the fall of 2015, the Pallottine Missionary Sisters transferred sponsorship of the hospital to United Hospital Center and WVU Medicine. The driving force behind the transaction is to continue to deliver the highest quality care in the most cost effective and efficient manner. By joining forces with UHC and WVU Medicine, St. Joseph’s Hospital ensures its long-term visibility for the community.